We had a blast playing this one, love the artwork and the combat is very smooth. Can't wait to play the full game. Awesome game! Smooth animations and satisfying combat. Looking forward to the full game! Eu realmente amei esse jogo! Valeu pela tradução, rs. Vou testar o jogo. Already have some good feedbacks here so I'm just passing by to report a bug that can be used to exploit the game. If you attack (X) then start spamming the toggle item button (B) it will spam attacks. Thanks! We're working on a fix. The exploit will be gone in the next update. Thanks for your kind words. About the delivery date of the full game: that depends on the succes of our crowd funding campaign. Be sure to stay tuned for that! Looks fun. Do you plan to release full version on itch.io too once the game is complete? Yes, if the upcoming crowdfunding campaign is a success. We would like to release the game on Itch and on Steam. I'd like a GOG release too, but itch is fine as a DRM-free option. The beutiful game, aproved =D I using in Linux !!! I wasn't sure if you guys realized one bug where when you hold down to aim the bomb, a white line/rectangle appears in the right corner above the aim curve. Awesome game though! Definitely funding, and keep up the good work. That was the only bug I encountered and it didn't affect gameplay at all. Thanks for the amazing game! Also one question, will the full game have an adventure aspect when transitioning through levels, menu based, or cutscene linear? The full game has a heavy adventuring aspect. It's quest based. You travel to locations on a world map. The locations itself are levels like the one you've played in the demo. Some levels have multiple exits and can be visited multiple times. Sharply spotted. Fixed it! Will be pushed to production in the next update. Hi, thanks! We don't any 32 bit hardware to test it on. Could you contact us? Then we can provide you with a 32bit download. If it works for you, we'll consider making it generally available. Very nice game. Great simplistic design, aesthetics, controls. Really fun. One little glitch though, if you attack then switch items really fast, you can do the same attack indefinitely. Made the game too easy but still very cool. Good find! We're going to fix that. amazing co-op ! We really enjoyed it and looking forward when the full game is released! Great playthrough guys! The collapsing crypt part is hilarious! There are not many co-op video's out there. Thanks for this one! Thanks for your feedback! Good to hear you enjoyed it! Online Multiplayer is not in our scrope. With the current set up of the game, that's too complex for a team of 2 devs to implement. Let alone ensuring maintenance and security. Couch coop is a good opportunity to meet up with your friends though :). Very tasty bit! Looks nice, plays nice, and there is even a story. I'd really appreciate option to exchange items & gold between players. Thanks for the kind words! Good idea about exchanging gold/items between players. We'll take that into consideration. Really good demo. It took me a few minutes to master the controllers I found it enjoyable all the way through. Can;t wait for the full release. 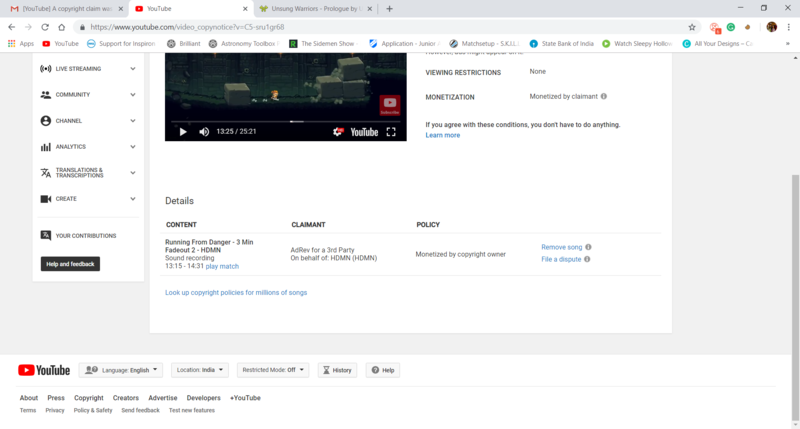 I got a copyright claim on your game background music. Thanks for bringing this to our attention, I had not expected this would happen. I bought a license for this song, so I'm going to take it up with the vendor. The song was specifically marketed as suitable for games, so I would assume that includes gameplay videos. Will get back to this asap. Meanwhile, if you still want to keep your video, you can have the song removed by Google's AI. The other audio will still be there. We're sorry about this, we'll do our best to fix it. Yes I want to keep my video. Sir you said you have the license for the song in your game then I will file for a dispute, so that they will re check it once more. Please wait with filing a dispute, we're looking into things as we speak. I will get back on this today. Edit: I've written a blog poston the matter. If you have any questions, be sure to let us know! NICE GAME MHANN. I MADE A VIDEO ON IT. This game was really good! I did end up experiencing a few bugs that are shown in the video. I can't wait to see more of this game! Aw, that's quite an annoying bug, sorry about that. What OS (win/mac/linux) are you using to play? Any specific controllers or just keyboard? Will do our best to reproduce and fix. At least happy that you liked the rest :). I am on windows 10 and using mouse and keyboard. Out of the 3 hours I played of the game that was really the only bug that happened with a few other small ones. This demo is really good. I had a lot of fun. My only gripe was that I wasn't able to use the D-Pad on my PS4 controller (the hats). Other than that, really good and will definitely play this when it fully comes out! Ow, I play on PS4 controller myself and I think it's the best way to play it, so definitely want to fix that for you. Could you tell us how you connect your controller (wired, bluetooth...) and what hardware you're using (win/mac/linux)? Then I can try to reproduce it. Sorry about the late response. I have connected my controller via a cable and am not using DS4windows or anything like that. I'm using windows 7 home. Hmm, I tried it on serveral PC's but I was not able to reproduce this. The d-pad (and the stick) work on all PC's with my DS4. Also not using any additional software. Maybe you can try it on a different PC and see if it works there? Or try connecting by bluetooth? Yeah, I just tried it with another PC and it worked. Probably something wrong with my drivers or something. I NEED THE FULL VERSION. PLEASE. I WILL GIVE YOU ALL MY MONEY, so like $15. Really loved this! Please let me know when your crowd funding is out etc. Thanks for playing! Nice to see you found your way to the secret area. Also appreciate the feedback. If you follow us here or subscribe to one of our channels (http://www.unsungwarriors.nl/contact.php) then you'll be notified when the crowd funding goes live. Thanks for playing! You could make it easier on yourself by using a shield (hold x on keyboard or left bumper on controller). The demo is available for PC, Linux and Mac. It was made with Unity. Nice, I really like your voice acting! And thanks for the constructive feedback. Here's my constructive response :). We do indeed support (many) controllers, should be plug and play. We also allow you to set up your custom key bindings, even on keyboard (can be found under settings). So be sure to try what suits you best and let us know! Liked the idea of the loadout swapping for keyboard. It's already possible to quickly toggle your range attack. Would be something worth considering for after the crowd funding (no promises made). The air control is indeed an intentional choice. By making it a bit slower, you favor precision at expense of speed. It is a tradeoff, but particularly useful if we up the difficulty on platforming a bit in certain sections of the full game. And too bad you didn't find the secret room. That would've allowed you to use a certain item on a certain stone ;). You can view it at some of your colleagues on youtube. Eitherway, thanks again for the careful analysis and feed back! Really dope so far Full Playthrough here with SECRET ROOM! ;) Forsure will play the entire game when it releases. Neatly done! And thanks for the compliment. Stay tuned for our crowd funding! THIS GAME IS AMAZING IN SO MANY WAYS!! Thank you so much! Stay tuned for our crowd funding. Oh, and Youtuber-related note, got a copyright claim on the video from the omnipresent AdRev for 'Running From Danger - 3 Min Fadeout 2 - HDMN '. That delayed publishing the video by... half a day. Thanks for the video! It's fun to see all the different tactics that people use to defeat the end boss. You even took the time to go back twice to discover new stuff! Haha, that was the intention! It was very fun. I did not have enough money to buy better weapons so I defeat Skeleton Boss using arrows and dash attacks. Thanks, also for the feedback! If you finished the boss I suppose you have enough coins now ;). Congratulations, you have done a job well done. The game is well balanced between difficulty and playability. When it is finished it will be a great game to play on PC or any other mobile platform. Really solid stuff you've got here! The art direction is awesome, the action works pretty well and the events of the dungeon always keep you on your toes! While it does feel a little lacking in mechanical depth for solo play, I'm sure it really shines in co-op! Going into the final boss rooms with just the default loadout? You've got guts dude ;). Thanks a lot for playing our game! For the remaining part, you can consider spicing things up with a bigger weapon or some magic spells (you can scroll down the buy list in the shop for more options). You can still head back to the shop on the left when you continue the boss level. Other than that, love the playthrough! Cool how you're figuring out certain design choices (eg 16:42). And much appreciate the feedback. The more we get, the further we can take this project.